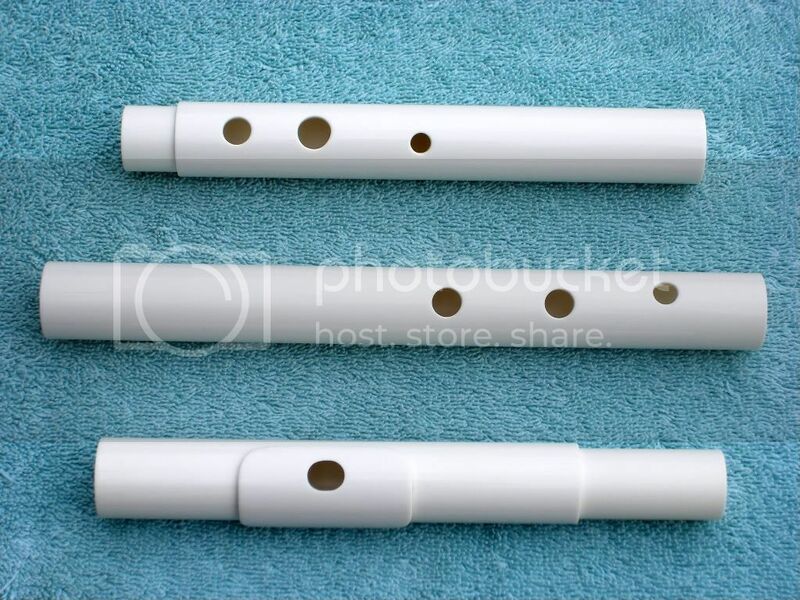 Several years ago Michael Eskin, an Irish musician and teacher near San Diego, CA, asked me if I would try to develop a pvc Irish flute that had an embouchure with a greater chimney depth than my standard pvc headjoint, which is made from thick-wall (0.125"), schedule 40 pvc pipe. I decided that by using a lip plate made from a piece of thin-wall (0.070") pvc pipe I would be able to increase the wall thickness at the embouchure to allow for a greater chimney depth. Recently, however, I have altered the default design of the embouchure hole on my flutes, making them oval and considerably larger, so the comments and sound files that I once posted here to show the difference between the flutes with and without the lip plate I believe are no longer valid and have been removed. To summarize my feelings and recommendations, here is my take on my current flute with and without the lip plate headjoint. I think that my standard flute without the lip plate plays quite well throughout the 2-3 octave range. With an embouchure depth (0.125"), slightly less than the standard Irish flute (0.157- .205"), the flute is quite agile throughout the range of the flute, although the first octave is not as strong as the lip plate flutes with a deeper embouchure chimney. That being said, a number of more-accomplished players have commented to me that they prefer to play the flute without the lip plate. They mention that it is easier to control and more effortless to play and that the tradeoff of a weaker low end is not a serious tradeoff in that the flute still plays quite well in the first octave and has a loud low D note. Keep in mind though that these are mature players with well-developed embouchures, and they have the skill to bring out the full-potential of my standard flute with the thinner embouchure chimney. The lip plate thickness makes the embouchure depth on my lip plate flutes at 0.195", which is a little thicker than most modern wooden Irish flutes (0.157" - .205"). Although both flutes with and without a lip plate are loud flutes, the lip plate flutes offer a very strong first octave and an increased blowing resistance, making it play more like a traditional wooden Irish flute for many players who are accustomed to playing a wooden or delrin, conical-bore Irish flute. The flute with the lip plate headjoint is not as responsive in the third octave as the standard flute. I don't notice much difference between the tone of the standard or the lip plate flutes. I received an email on 2-10-09 from a customer in London, England who had just received my flute with the lip plate headjoint. He commented that "the lower register and bottom D is to kill for. Many thanks for the lovely flute. It will be going with me to CARNAVAL in Portugal in about 10 days time." On Feb. 9, 2011 Michael Eskin, giving advice to a beginning player (low D flute), wrote on the Flute Forum at Chiff & Fipple: "I don't agree that the lip plate is a good choice for a brand new player. The flute without the lip plate is much easier to play. The lip plate does provide a greater depth, which can be exploited by a more experienced player, but having played and evaluated both, I'd suggest going with the non-lip plate version." I will have to second Michael's opinion here and say that my current recommendation for a beginning player is a low D flute with the standard headjoint (without the lip plate) and either the small round on the larger oval embouchure hole. I personally prefer oval embouchure hole. I am offering the lip plate as an option for my medium-size large bore flutes in Eb and D. I think that the smaller flutes (G, F, E) play better without the lip plate The lip plate headjoint is recommend for my low flutes (C#, C, B, and Bb)t, as the deeper embouchure chimney provided by the lip plate makes for a stronger-playing low flute. The charge is + $25 for the lip plate with the purchase of a new flute. I cannot add a lip plate to an existing headjoint, although I can make a new lip plate headjoint for an existing flute. I would need to have the flute body returned to me to properly match the pvc and fit the tenon joint. Currenty, my 3-piece, 6-hole low D flute with a lip plate headjoint and oval embouchure hole + Tipple-Fajardo wedge is my most popular flute.You can click on the photo to zoom in.